Winston Churchill is considered by many the world's greatest leader of the 20th century. Churchill was born 1874 in Oxfordshire, England in Blenheim palace. He is another example of great British men who shunned education but had great qualities of leadership, was an inspirational statesman, writer and orator. 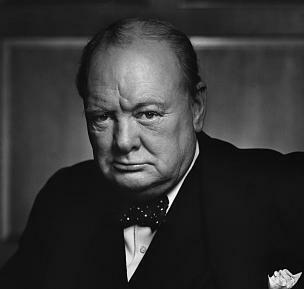 At the outbreak of World War II, Churchill became First Lord of the Admiralty in command of the Royal Navy. The current Prime Minister, Neville Chamberlain, wanted to appease Germany and Hitler and famously waved a paper that he said promised peace. Churchill knew this would not work and warned the government that they needed to help fight Hitler or Germany would take over all of Europe. Churchill said of appeasement: "An appeaser is one who feeds a crocodile, hoping it will eat him last." The country lost confidence in Chamberlain, he resigned and Winston Churchill was chosen to be his successor as Prime Minister on May 10, 1940. He was later to write: 'I felt...that all my past life had been but a preparation for this hour and for this trial'. Parallels with later events in the EU? From the opposition party Labour politician Hugh Dalton said Churchill was 'the only man we have for this hour'. This view was shared by the overwhelming majority of the British people. As Germany invaded Europe Churchill used his negotiating skills to forge an alliance of Allied Powers with the Soviet Union and the United States. Roosevelt and the US were not keen to help out even though Britain's resources were at a low from the Great War. So Churchill agreed to share Britain's technology with the USA in the hope that Roosevelt could be persuaded to join the war. The Tizard Mission as it was known, involved giving the USA Jet, Radar, VT fuse and Atomic Bomb technology to the annoyance of the patent holders. His British Bulldog virtues pulled the country behind him. Of the Battle of Britain he said "Never was so much owed by so many to so few" a pivotal air battle against the German Luftwaffe. Britain faced its supreme test. It is for his leadership through these fraught years of 1940-1945 - through Dunkirk, the Battle of Britain and the Blitz - that Churchill is best remembered. He lead Britain to victory in Europe in 1945. Sir Winston Churchill took his final journey on the historic vessel Havengore along the River Thames for his State Funeral on 30th January 1965. This iconic and very public event was televised live watched worldwide by an audience of 350 million people.